I've often read arguments that computing circuitry running at a high frequency is inefficient, power-wise or silicon area-wise or both. So roughly, 100 MHz is more efficient, in that you get more work done per unit of energy or area spent. And CPUs go for 1 GHz or 3 GHz because serial performance sells regardless of efficiency. But accelerators like GPUs or embedded DSPs or ISPs or codecs implemented in hardware etc. etc. – these don't need to run at a high frequency. And I think this argument is less common now when say GPUs have caught up, and an embedded GPU might run at the same frequency as an embedded CPU. But still, I've just seen someone peddling a "neuromorphic chip" or some such, and there it was – "you need to run conventional machines at 1 GHz and it's terribly inefficient." …and what fueled the myth is, accelerator makers used to be much worse at designing for high frequency than CPU makers. So marketeers together with "underdog sympathizers" have overblown the frequency vs efficiency trade-off completely out of proportions. Silicon area. The higher the clock frequency, the more things the same circuit occupying this area does per unit of time – so you win! Leakage power – just powering up the circuit and doing nothing, not even toggling the clock signal, costs you a certain amount of energy per unit of time. Here again, the higher the frequency, the more work gets done in exchange for the same leakage power – again you win! Switching power – every time the clock signal changes its value from 0 to 1 and back, this triggers a bunch of changes to the values of other signals as dictated by the interconnection of the logic gates, flip-flops – everything making up the circuit. All this switching from 0 to 1 and back costs energy (and NOT switching does not; measure the power dissipated by a loop multiplying zeros vs a loop multiplying random data, and you'll see what I mean. This has implications for the role of software in conserving energy, but this is outside our scope here.) What's the impact of frequency on cost here? It turns out that frequency is neutral - the cost in energy is directly proportionate to the clock frequency, but so is the amount of work done. Overall, higher frequency means spending less area and power per unit of work – the opposite of the peanut gallery's conventional wisdom. At some point, however, higher frequency does start to increase the cost of the circuit per unit of work. The reasons boil down to having to build your circuit out of physically larger elements that leak more power. Even further down the frequency-chasing path come other problems, such as having to break down your work to many more pipeline stages, spending area and power on storage for the intermediate results of these stages; and needing expensive cooling solutions for heat dissipation. So actually there are several points along the road, with the cost of extra MHz growing at each point – until you reach the physically impossible frequency for a given manufacturing process. How do you find the point where an extra MHz isn't worth it? For synthesizable design (one created in a high-level language like Verilog and VHDL), you can synthesize it for different frequencies and you can measure the cost in area and power, and plot the results. My confidence of where I think the inflection point should be comes from looking at these plots. Of course the plot will depend on the design, bringing us to the next point. You need to break the harder things into smaller pipeline stages (yes, a cost in itself as we've just said – but usually a small cost unless you target really high frequencies and so have to break everything into umpteen stages.) Pipelining is hard to get right when the pipeline stages are not truly independent, and people often recoil from it (a hardware bug is on average more likely to be catastrophically costly than somewhat crummier performance.) Simpler designs also shorten schedules, which may be better than reaching a higher frequency later. Accelerators are different. You can to some extent compensate for poor serial performance by throwing money at the problem - add more cores. Sometimes you don't care about extra performance – if you can decode video at the peak required rate and resolution, extra performance might not win more business. Between frequency improvements and architecture improvements/implementing a huge new standard, the latter might be more worthwhile. And then the budgets are generally smaller, so you tend to design more conservatively. So AFAIK this is why so many embedded accelerators had crummy frequencies when they started out (and they also had apologists explaining why it was a good thing). And that's why some of the accelerators caught up – basically it was never a technical limitation but an economic problem of where to spend effort, and changing circumstances caused effort to be invested into improving frequency. And that's why if you're making an accelerator core which is 3 times slower than the CPU in the same chip, my first guess is your design isn't stellar at this stage, though it might improve – if it ever has to. P.S. I'll say it again – my perspective can be skewed; someone with different experience might point out some oversimplifications. Different process nodes and different implementation constraints mean that what's decisive in one's experience is of marginal importance in another's experience. So please do correct me if I'm wrong in your experience. P.P.S. Theoretically, a design running at 1 GHz might be doing the exact same amount of work as a 2 GHz design – if the pipeline is 2x shorter and each stage in the 1 GHz thing does the work of 2 stages in the 2 GHz thing. In practice, the 1 GHz design will have stages doing less work, so they complete in less than 1 nanosecond (1/1GHz) and are idle during much of the cycle. And this is why you want to invest some effort to up the frequency in that design – to not have mostly-idle circuitry leaking power and using up area. But the theoretically possible perfectly balanced 1 GHz design is a valid counter-argument to all of the above, I just don't think that's what most crummy frequencies hide behind them. So this makes sense when silicon area is tremendously cheaper than energy, or when there's a hard limit on how much energy you can spend but a much laxer limit on area. This is not the case most of the time, AFAIK (silicon costs a lot and then it simply takes physical space, which also costs), but it can be the case some of the time. NTV can also make sense if voltage is adjusted dynamically based on workload, and you don't need high performance most of the time, and you don't care that your peak performance is achieved at a 2x area cost as much as you're happy to be able to conserve energy tremendously when not needing the performance. Anyway, it goes to show that it's more complicated than I stated, even if I'm right for the average design made under today's typical constraints. Update (June 21): this article has been published at embeddedrelated.com, where I hope to publish a follow-up soon. We'll start with a common explanation of FPGAs' relatively low popularity. We'll see why that explanation is wrong – and why, if we take a closer look, we actually come to expect FPGAs to blow the competition out of the water! …to the question of "why aren't FPGAs more popular?" is, "FPGA is a poor man's alternative to making chips. You can implement any circuit design in an FPGA, but less efficiently than you could in an ASIC or a custom design. So it's great for prototyping, and for low-volume products where you can't afford to make your own chips. But it makes no sense for the highest-volume devices – which happen to add up to 99% of sales, leaving 1% to FPGAs." When programmability is required – which is extremely often – then the right thing to compare FPGAs to is another programmable platform: a DSP, a GPU, etc. And, just like FPGAs, all of these necessarily introduce some overhead for programmability. So we can no longer assume, a priori, that any one option is more efficient than another – as we did when comparing FPGAs to single-purpose ASICs. So for that benchmark, FPGAs offer 10x-100x the runtime performance, and 2x-30x the energy efficiency of DSPs – quite impressive! But wait – how are they so efficient? Programmable gate arrays can't multiply as efficiently as dedicated multipliers, can they? A dedicated multiplier is a bunch of gates connected with wires – the specific gates that you need for multiplying, connected specifically to the right other gates as required for multiplication. All this is indeed true, and a "bare" FPGA having nothing but programmable gates and routers cannot compete with a DSP. However, today's FPGAs come with DSP slices – specialized hardware blocks placed amidst the gates and routers, which do things like multiply-accumulate in "hard", dedicated gates. 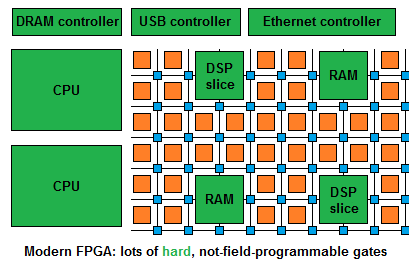 So that's how FPGAs compete with DSPs – they have DSP hardware in them! Cheating, isn't it? 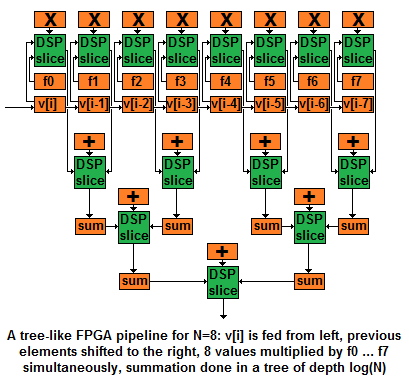 To be competitive in DSP applications, FPGAs need DSP slices – ALUs doing things like multiply-accumulates. To be competitive in applications needing a CPU – which is most of them – today's FPGAs have more than just specialized ALUs. They have full-blown ARM cores implemented using "hard", non-programmable gates! For instance, TI's C64 DSPs can do 8 MACs per cycle – but only if it's a dot product. TI's C66 DSPs can do 32 MACs/cycle – but only if you're multiplying complex numbers. You only get the highest throughput for very specific data flows. No need for full-blown ALUs for simple operations: a 2-bit adder doesn't need to be mapped to a large, "hard" DSP slice – it can fit comfortably in a small piece of "soft" logic. With most processors, you'd "burn" a full-blown ALU to do the simplest thing. Distributed operand routing: most processors have their ALUs communicate through register files. With all the ALUs connected to all the registers, there's a bottleneck – this interconnect grows as the product of the number of ALUs and registers, so you can't have too many of either. FPGAs spread ALUs and registers throughout the chip, and you can connect them in ways not creating such bottlenecks – say, as a long chain, as a tree, and in many other ways. Of course you can also route everything through a bottleneck, and then your design will run at a low frequency – but you don't have to. With CPUs or DSPs, they run at a high frequency – because the amount of ALUs and registers was limited to make that frequency possible. But in FPGAs you can get both high frequencies and a lot of resources used in parallel. Distributed command dispatching: a 2-issue or a 6-issue processor is common, but 100-issue processors are virtually unheard of. Partly it's because of the above-mentioned operand routing, and partly it's because of command dispatching – you'd have to fetch all those commands from memory, another bottleneck. In FPGAs, you can implement command-generating logic in simple state machines residing near your ALUs – and in the simplest case, commands are constants kept in registers residing near ALUs. This lets you easily issue 100 parallel instructions. In this drawing, N=8, but it scales easily to arbitrary N, producing results at a slightly larger latency – the summation tree depth being log(N). The trick is this. The elements of v are also moving downstream, together with the sums. But after v[i] got multiplied by f0, you don't want to multiply it by f1 in the next cycle. Instead, you want to multiply v[i-1] by f1 – that's the product that we need for the convolution at index i. And then you do want to multiply v[i] by f1 once cycle later – for the convolution at index i+1. I hope that my sampling of v[i] to an intermediate register, which delays its downstream motion, does the trick. This gives us a new perspective on LUTs and switch boxes. Yes, they can be an inefficient, cheaper-to-manufacture alternative to dedicated gates and wires. But they are also a mechanism for utilizing the "hard" components spread in between them – sometimes better than any other mechanism. But wait – there's more! In addition to being a hardware prototyping platform and an accelerator architecture, FPGAs are also uniquely suited for software-defined I/O. "Software-defined I/O" is the opposite of "hardware-defined I/O" – the common state of things, where you have, for instance, an Ethernet controller implementing some share of TCP or UDP in hardware. Software-defined I/O is when you have some programmable hardware instead of dedicated hardware, and you implement the protocols in software. Timing control: Verilog and other hardware description languages give you more precise control over timing than perhaps any other language. If you program it to take 4 cycles, it takes 4 cycles – no cache misses or interrupts or whatever will get in your way unexpectedly. And you can do a whole lot in these 4 cycles – FPGAs are good at issuing plenty of instructions in parallel as we've seen. This means you don't have to account for runtime variability by buffering incoming data, etc. – you know that every 4 cycles, you get a new byte/pixel/etc., and in 4 cycles, you're done with it. This is particularly valuable where "deep" buffering is unacceptable because the latency it introduces is intolerable – say, in a DRAM controller. You can also do things like generating a clock signal at a desired frequency, or deal with incoming clock signal at a different frequency than yours. And of course, FPGA's I/O capabilities can be combined with computation acceleration – get pixels and enhance the image color on the fly, get IP packets with stock info and decide which stocks to trade on the fly. Instead of fixed-function gates and wires connecting specific gates to each other, FPGAs use programmable gates – configured by setting a truth table of choice – and programmable switch boxes, where incoming wires are connected to some of the other wires based on configuration bits. By itself, it's very inefficient compared to a "direct" implementation of a circuit. Then how can FPGAs beat, not just CPUs, but specialized accelerators like DSPs in their own game? 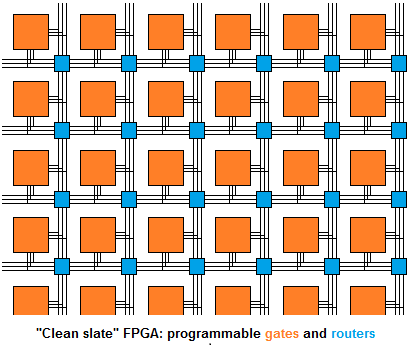 The trick is, they're no longer FPGAs – gate arrays. Instead, they're also arrays of RAMs and DSP slices. And then they have full-blown CPUs, Ethernet controllers, etc. implemented in fixed-function hardware, just like any other chip. In such modern FPGAs, the sea of LUTs and switch boxes can be used not instead of fixed-function circuits, but as a force multiplier letting you make full use of your fixed-function circuits. 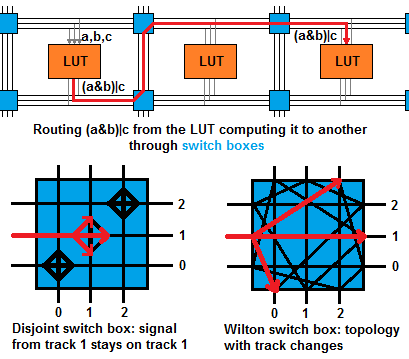 LUTs and switch boxes give two things no other processor architecture has. First, the ability to use less than a full-blown ALU for simple things – and less than a full clock cycle. Second, distributed routing of commands and operands – arguably more flexible than SIMD, more scalable than superscalar execution, and more efficient than multiple instruction streams. Fixed-function hardware essential for performance – this gradually progressed from RAM to DSP slices to complete CPUs. Quick runtime reconfiguration, so that you can run convolution and then replace it with FFT – which you can't, and shouldn't be able to do, if you're thinking of FPGA as simulating one circuit. 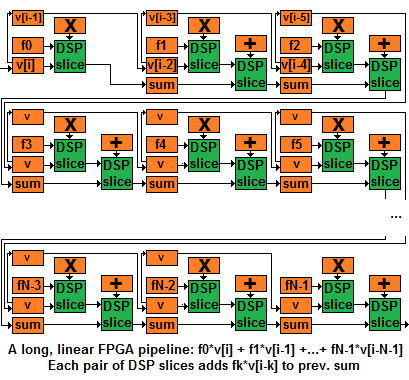 Why do FPGAs have DSP slices and full-blown "hard" CPUs? Why not the other way around – full-blown DSP cores, and some sort of smaller "CPU slices"? Where are the GPU slices? And if rationing individual gates, flip-flops and picoseconds instead of full ALUs, registers and clock cycles is so great, why doesn't everyone else do it? Why do they all break up resources into those larger chunks and only give software control over that? Stay tuned for the sequel – "How FPGAs work, and why you won't buy one". This example shows how "distributed routing" actually looks in code – and the fine-grained control over resources, defining things like 17-bit registers. Incidentally, Verilog is perhaps the quintessential object-oriented language – everything is an object, as in a physical object: a register, a wire, a gate, or a collection of simpler objects. A module is like a class, except you can't create objects (called instantiations) dynamically – all objects are known at compile time and mapped to physical resources. Verilog insists on encapsulation as strictly as it possibly could: there's simply no way to set an object's internal state. Because how could you affect that state, physically, without a wire going in? Actually, there is a way to do that – the usual instance.member syntax; hardware hackers call this "an antenna", because it's "wireless" communication with the object's innards. But it doesn't synthesize – that is, you can do it in a simulation, but not in an actual circuit. A triumph of encapsulation, it's also a bit of a pity, because there are now actual wires and some control logic sitting near our coefficient registers, enlarging the circuit, only to be used upon initialization. We're used to class constructors "burning" a few memory bits; who cares – the bits are quickly swapped out from the instruction cache, so you haven't wasted resources of your computational core. But Verilog module initialization "burns" LUTs and wires, and it's not nearly as easy to reuse them for something else. We'll elaborate on this point in the upcoming sequel. On top of its object-oriented, event-based, parallel core, Verilog delivers a ton of sweet, sweet syntactic sugar. You can write + and * instead of having to instantiate modules with "adder myadd(a,b)" or "multiplier mymul(a,b)" – though + and * are ultimately compiled down to module instances (on FPGAs, these are often DSP slice instances). You can use if statements and array indexing operators instead of instantiating multiplexors. And you can write loops to be unrolled by the compiler, generate instantiations using loop syntax, parameterize your designs so that constants can be configured by whoever instantiates them, etc. etc. If all this doesn't excite you and you'd rather program in C, you can, sort of. There's been loads of "high-level synthesis tools" – basically C to Verilog compilers – and their quality increased over the years. But you can use C, sort of – or Verilog, for real. Either way, you can write fairly readable FPGA programs. It's been a decade or so since the end of frequency scaling, and multicore has become ubiquitous, there being no other means to increase a chip's performance. Some multicore systems are symmetric – all cores are identical, so you can easily move work from one core to another. Others are asymmetric – as in CPU cores and GPU cores, where it's harder to move work between different types of cores. Which is better – symmetric or asymmetric multicore? Asymmetric multicore makes load balancing harder, because a GPU can't easily yank a job from a queue shared with a CPU and run that job. That's because some of those jobs are simply impossible to run on a GPU. Others run so badly that it's not worth the trouble. And then you need a shared queue between the CPU and the GPU – how does that work? – or you partition the work statically (each of the 4 CPUs processes 10% of the pixels, the remaining 60% of the pixels go to the GPU cores). But static partitioning, often quite lousy even with symmetric multicore, is awful with asymmetric multicore because how do you choose the percentages? You need to know the relative strength of the cores at each task. How do you do that – dynamically figure out the first time your program runs on a new device? So this is all close to insane. What people actually do instead is task parallelism – they look at their different jobs, and they figure out which should run on each type of core, and optimize each task for the respective core. But task parallelism never load-balances very well. Let's say you look for faces in an image on the GPU and then try to figure out whose faces these are on the CPUs. Then sometimes the GPU finds a lot of faces and sometimes just a few, taking roughly the same time to do so. But the CPU then has either a lot of work or just a little. So one of them will tend to be the bottleneck. We actually touched on that above. If you wanted to do data parallelism, running the same task on all your cores but on different subsets of the data, one problem would be to optimize your code for each type of core. That's more work. Someone at the OS/system level would also need to help you with sharing task queues and vtables – still more work. Generally, more types of core means more hardware design, more compilers, assemblers, linkers and debuggers, more manuals, and more integration work from bus protocols to program loaders, etc. etc. And, for programmers, not only more optimization work but more portability problems. That's a bit futuristic, but I actually heard this argument from respectable people. The idea is, chip manufacturing yields will significantly drop at, say, 8nm processes. And then your chance to get a chip without a microscopic defect somewhere will become so low that throwing away every defective chip will be uneconomical. Well, with symmetric multicore you don't have to throw away the chip. If the testing equipment identifies the core that is no longer useable and marks the chip accordingly using fuses or some such (which is easy to do), an OS can then run jobs on all cores but the bad one. With asymmetric multicore, you can't do that, because some type of work will have no core on which it can run. In two words – dark silicon. "Dark silicon" is a buzzword used to describe the growing gap between how many transistors you can cram into a chip with each advancement in lithography vs how many transistors you can actually use simultaneously given your power budget – the gap between area gains and power gains. It's been a couple of years since the "dark silicon" paper which predicted "the end of multicore scaling" – a sad follow-up to the end of frequency scaling. The idea is, you can have 2x more cores with each lithography shrink, but your energy efficiency grows only by a square root of 2. So 4 shrinks mean 16x more cores – but within a fixed power budget, you can only actually use 4. So progress slows down, so to speak. These numbers aren't very precise – you have to know your specific process to make a budget for your chip – but they're actually not bad as a tool to think about this. With 16x more area but just 4x more power, can anything be done to avoid having that other 4x untapped? It appears that the only route is specialization – spend a large fraction of the area on specialized cores which are much faster at some useful tasks than the other cores you have. Can you then use them all in parallel? No – symmetric or asymmetric, keeping all cores busy is outside your power budget. But, if much of the runtime is spent running code on specialized cores doing the job N times faster than the next best core, then you'll have regained much of your 4x – or even gained more than 4x. Gaining more than 4x has always been possible with specialized cores, of course; dark silicon is just a compelling reason to do it, because it robs you of the much easier alternative. What about load balancing? Oh, aren't we "lucky"! It's OK that things don't load-balance very well on these asymmetric systems – because if they did, all cores would be busy all the time. And we can't afford that – we must keep some of the silicon "dark" (not working) anyway! And what about redundancy? I dunno – if the yield problem materializes, the increasingly asymmetric designs of today are in trouble. Or are they? If you have 4 CPUs and 4 GPU clusters, you lose 25% of the performance, worse than if you had 12 CPUs; but the asymmetric system outperforms the symmetric one by more than 25%, or so we hope. So the bright side of dark silicon is that it forces us to develop new core architectures – because to fully reap the benefits of lithography shrinks, we can't just cram more of the same cores into a same-sized chip. Which, BTW, has been getting boring, boring, boring for a long time. CPU architecture has stabilized to a rather great extent; accelerator architecture, not nearly so. GPUs are the tip of the iceberg, really – the most widely known and easily accessible accelerator, but there are loads of them coming in endless shapes and colors. And as time goes by and as long as transistors keep shrinking but their power efficiency lags behind, we'll need more and more kinds of accelerators. And this is why the CPU will likely occupy an increasingly small share of the chip area, continuing the trend that you can see in chip photos from ChipWorks et al. I work on switching-limited chip designs: most of the energy is spent on switching transistors. So you don't have to power down the cores between tasks – you can keep them in an idle state and they'll consume almost no energy, because there's no switching – zeros stay zeros, and ones stay ones. Chips which run at higher frequencies and which are not designed to operate at high temperatures (where high leakage would become intolerably high – leakage grows non-linearly with temperature) are often leakage-limited. This means that you must actually power down a core or else it keeps using much of the energy it uses when doing work. Sometimes powering down is natural, as in standby mode. Powering down midway through realtime processing is harder though, because it takes time to power things down and then to power them back up and reinitialize their pesky little bits such as cache line tags, etc. So in a leakage-limited design, asymmetric multicore is at some point no better than symmetric multicore – if the gaps between your tasks are sufficiently short, you can't power down anything, and then your silicon is never dark, so either you make smaller chips or programs burn them. But powering up and down isn't that slow, so a lot of workloads should be far from this sad point. I know about GreenDroid, a project by people who make the "dark silicon leads to specialization" argument quite eloquently; I don't think their specialization is the right kind – I think cores should be programmable – but that again is a subject for a separate discussion. Of course there's one thing you can always do with extra area which is conceptually much easier than adding new types of cores – namely, add more memory, typically L2/L3 cache. Memory is a perfect fit for the dark silicon age, because it essentially is dark silicon – its switching energy consumption is roughly proportionate to the number of bytes you access per cycle but is largely independent of the number of bytes you keep in there. And as to leakage, it's easier to minimize for memories than most other kinds of things. Another "lucky" coincidence is that you really need caches these days because external DRAM response latency has been 100 ns for a long time while processor clocks tend to 50-200x shorter, so missing all the caches really hurts. So it's natural to expect memories to grow first and then the accelerator zoo; again consistently with recent chip photos where, say, ARM's caches are considerably bigger the ARM cores themselves. Once a chip’s single-core performance lags by more than a factor to two or so behind the higher end of current-generation commodity processors, making a business case for switching to the wimpy system becomes increasingly difficult. – Google's Urs Hölzle, in "Brawny cores still beat wimpy cores, most of the time"
Google sure knows its own business, so they're probably right when they claim that they need high serial performance. However, different businesses are different, and there are advantages to "wimpy cores" beyond power savings which are omitted from the "brawny/wimpy" paper and which are worth mentioning. Some of your tasks can be parallelized to run on 4 cores – these will take the same time to complete on the two systems. Other tasks can only run on one core – these will take 4x more time to complete on the 750 MHz wimpy-core system. Some tasks are in-between – say, a task using 2 cores will take 2x more time to complete on the 750 MHz system. Overall, the 3 GHz system never completes later and sometimes completes much earlier. However, this assumes that a 3 GHz processor is consistently 4x faster than a 750 MHz processor. This is true in those rare cherished moments when both processors are running at their peak throughput. It's not true if both are stuck waiting for a memory request they issued upon a cache miss. For years, memory latency has been lagging behind memory throughput, and the 4x faster processor does not get a 4x smaller memory latency. Assuming the latency is the same on the two systems – which is often very close to the truth – and that half of the time of the 750 MHz system is spent waiting for memory when running a serial task, the 3 GHz CPU will give you a speed-up of less than 2x. What if the task can run in parallel on 4 cores? Now the 750 MHz system gets a 4x speed-up and completes more than 2x faster than the 3 GHz system! A slow, parallel system outperforming a fast, serial system – Amdahl's law in reverse! In a way it isn't – there are many cases where faster systems fail to get to their peak throughput because of some latency or other. For instance, the cost of mispredicted branches will generally be higher on faster systems. However, most other latencies of these kinds are much smaller – and are handled rather well by the mechanisms making "brawny" cores larger and deserving of their name. For example, hardware branch predictors and speculative execution can go a long way in reducing the ultimate cost of mispredicted branches. "Brawny" speculative hardware is useful enough to deal with memory latency as well, of course. Today's high-end cores all have speculative memory prefetching. When you read a contiguous array of memory, the core speculates that you'll keep reading, fetches data ahead of the currently processed elements, and when time comes to process the next elements, they're already right there in the cache. 1. They reduce the benefit of out-of-order execution. 2. They throw off hardware prefetching. 3. They reduce DRAM and TLB locality. 4. They cannot leverage SIMD. 5. They are harder to send to GPUs. Note that problems 1, 2 and 4 "disappear" on wimpy cores – that is, such cores don't have out-of-order execution, hardware prefetchers or SIMD instructions. So a linked list doesn't result in as many missed performance opportunities as it does on brawny cores. "Why would anyone use linked lists"? It's not just lists, for starters – it's arrays of pointers as well. "Why array of pointers" seems exceedingly obvious – you want to keep references instead of values to save space as well as to update something and actually get the thing updated, not its copy. Also you can have elements of different types – very common with OO code keeping arrays of base class pointers. And then using arrays and indexing into them instead of using pointers still leaves you with much of the "access randomness" problem. 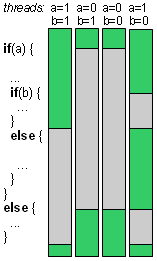 A graph edge can be a pointer or an index; and while mallocing individual nodes might result in somewhat poorer locality than keeping them in one big array, you still bump into problems 1, 2 and 4 for big enough node arrays – because your accesses won't go from 0 to N.
Of course you could argue that memory indirection is "poor design" in the modern world and that programmers should mangle their designs until they fit modern hardware's capabilities. But then much of the "brawny vs wimpy" paper's argument is that brawny cores mean smaller development costs – that you get high performance for little effort. That's no longer true once the advice becomes to fight every instance of memory indirection. It's also somewhat ironic from a historical perspective, because in the first place, we got to where we are because of not wanting to change anything in our software, and still wishing to get performance gains. The whole point of brawny speculative hardware is, "your old code is fine! Just give me your old binaries and I'll magically speed them up with my latest and greatest chip!" The upshot is that you can't have it both ways. Either keep speculating (what, not brawny/brainy enough to guess where the next pointer is going to point to? ), or admit that speculation has reached its limits and you can no longer deliver on the promises of high serial performance with low development costs. …is not something I'd want to do. Amdahl's law has a formal version where you take numbers representing your workload and you get a number quantifying the benefits a parallel system might give you. 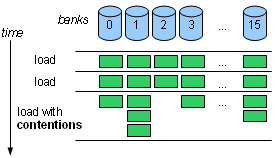 A similar formalization could be done for "reverse Amdahl's law", taking into account, not just limits to parallelization due to serial bottlenecks (what Amdahl's law does), but also "limits to serialization"/the advantage to parallelization due to various kinds of latency which is better tolerated by parallel systems. But I think the point here is that simple formal models fail to capture important factors – not that they should be made more complex with more input numbers to be pulled out of, erm, let's call it thin air. You just can't sensibly model real programs and real processors with a reasonably small bunch of numbers. Speaking of numbers: is time spent waiting actually that large? Could a "wimpy-core" system improve things for you? It depends. I'm just pointing out why it could. There's a trend of putting a single wimpy core alongside several brawny ones, the wimpy core being responsible for tasks where energy consumption is important, and the brawny ones being used when speed is required. An interesting alternative is to put one brawny core and many wimpy ones – the brawny core could run the serial parts and the wimpy cores could run the parallel parts. If the task is serial, then a brawny core can only be better – perhaps a lot better, perhaps a little better, but better. If the task is parallel, many wimpy cores might be better than few brawny ones. …is also something that helps hide latency using coarse-grain, thread-level parallelism; it doesn't have to be "whole cores". …is/can be much easier and safer than is commonly believed. But that's a subject for a separate series of posts. All this on top of area & power savings of many wimpy cores compared to few brawny ones. Macroarchitecture - the "visible" parts, the contract between hardware and software. For example, branch instructions. Microarchitecture - the "invisible" parts, the implementation strategy which affects performance but not semantics. For example, branch prediction. It pops up everywhere. That is, many hardware problems can be addressed at the macro level or the micro level, explicitly or implicitly. The choice of macro vs micro is rarely trivial – for most problems, there are real-world examples of both kinds of solutions. The choice has common consequences across problems. The benefits and drawbacks of macro and micro are frequently similar. I'll use examples from diverse types of hardware – CPUs, DSPs, GPUs, FPGAs, CAPPs, and even DRAM controllers. We'll discuss some example problems and how they can be solved at the macro or micro level. I'll leave the discussion of the resulting trade-offs to separate write-ups. Here, we'll go through examples to see how practical macro and micro solutions to different problems look like. Suppose you want to have a data-parallel machine: software issues one instruction that processes multiple data items. The common macro approach is wide registers and SIMD opcodes. To use the feature, software must explicitly break up its data into 16-byte chunks, and use special opcodes like "add_16_bytes" to process the chunks. One mirco approach is what NVIDIA marketing calls SIMT. The instruction set remains scalar. 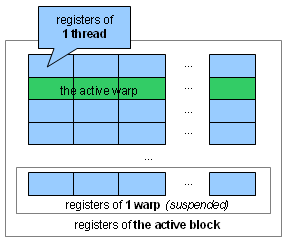 However, hw runs multiple scalar threads at once, with simultaneously running threads all executing the same instruction. That way, 16 pairs of values are added in a single cycle using scalar instructions. Suppose you want to have a multiple issue machine. You want to simultaneously issue multiple instructions from a single thread. The macro approach is VLIW, which stands for "very long instruction word". The idea is, those multiple instructions you issue become "one (very long) instruction", because software explicitly asks to run them together: "ADD R0, R1, R2 and MUL R3, R0, R5". Note that ADD and MUL "see" the same value of R0: MUL gets R0's value before it's modified by ADD. VLIW also lets software choose to say, "ADD R0, R1, R2; afterwards, MUL R3, R0, R5" – that's two separate instructions yielding vanilla serial execution. This is not only slower (2 cycles instead of 1), but has a different meaning. This way, MUL does see ADD's change to R0. Either way, you get what you explicitly asked for. The micro approach, called superscalar execution, is having the hardware analyze the instructions and run them in parallel – when that doesn't change the hw/sw contract (the serial semantics). For example, ADD R0, R1, R2 can run in parallel with MUL R3, R1, R2 – but not with MUL R3, R0, R5 where MUL's input, R0, depends on ADD. Software remains unaware of instruction-level parallelism – or at least it can remain unaware and still run correctly. We've just discussed issuing multiple instructions simultaneously. A related topic is issuing instructions before a previous instruction completes. Here, the macro approach is to, well, simply go ahead and issue instructions. It's the duty of software to make sure those instructions don't depend on results that are not yet available. 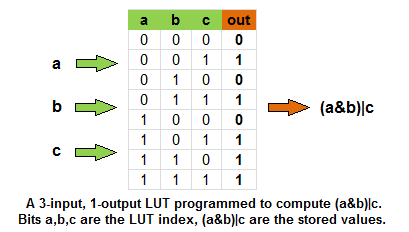 For example, a LOAD instruction can have a 4-cycle latency. Then if you load to R0 from R1 and at the next cycle, add R0 and R2, you will have used the old value of R0. If you want the new value, you must explicitly wait for 4 cycles, hopefully issuing some other useful instructions in the meanwhile. 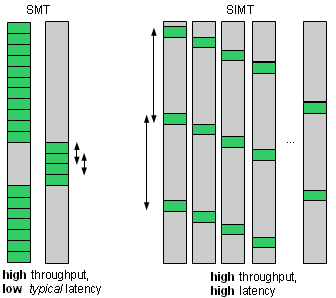 The micro approach to handling latency is called OOO (out-of-order execution). Suppose you load to R0, then add R0 and R2, and then multiply R3 and R4. An OOO processor will notice that the addition's input is not yet available, proceed to the multiplication because its inputs are ready, and execute the addition once R0 is loaded (in our example, after 4 cycles). The hw/sw contract is unaffected by the fact that hardware issues instructions before a previous instruction completes. Suppose you want to have some RAM local to your processor, so that much of the memory operations work with this fast RAM and not the external RAM, which is increasingly becoming a bottleneck. The macro approach is, you just add local RAM. There can be special load/store opcodes to access this RAM, or a special address range mapped to it. Either way, when software wants to use local RAM, it must explicitly ask for it – as in, char* p = (char*)0×54000, which says, "I'll use a pointer pointing to this magic address, 0×54000, which is the base address of my local RAM". This is done on many embedded DSPs and even CPUs – for example, ARM calls this "tightly-coupled memory" and MIPS calls this "scratch pad memory". The hardware changes greatly, the hw/sw contract does not. Suppose you want to support efficient "streaming transfers". DRAM is actually a fairly poor random access memory – there's a big latency you pay per address. However, it has excellent throughput if you load a large contiguous chunk of data. To utilize this, a processor must issue loads without waiting for results of previous loads. Load, wait, load, wait… is slow; load, load, load, load… is fast. The macro approach is, sw tells hw that it wants to load an array. For example, a DMA – direct memory access – engine can have control registers telling it the base address and the size of an array to load. Software explicitly programs these registers and says, "load". DMA starts loading and eventually says, "done" – for example, by setting a bit. In the meanwhile, sw does some unrelated stuff until it needs the loaded data. At this point, sw waits until the "done" bit is set, and then uses the data. The micro approach is, software simply loads the array "as usual". Naturally, it loads from the base address, p, then from p+1, then p+2, p+3, etc. At some point, a hardware prefetcher quietly inspecting all the loads realizes that a contiguous array is being loaded. It then speculatively fetches ahead – loads large chunks beyond p+3 (hopefully not too large – we don't want to load too much unneeded data past the end of our array). When software is about to ask for, say, p+7, its request is suddenly satisfied very quickly because the data is already in the cache. This keeps working nicely with p+8 and so on. Let's get back to basics. Suppose we want to add a bunch of numbers. How does software tell hardware to add numbers? The micro approach is so much more common that it's the only one that springs to mind. Why, of course hardware has an ADD command, and it's implemented in hardware by some sort of circuit. There are degrees here (should there be a DIV opcode or should sw do division?) But the upshot is, there are opcodes. Of course, you can simulate multiplication using bitwise operations on conventional opcode-based processors. But that would leave much of the hardware unused. On FPGAs and CAPPs, on the other hand, "building things out of bits" is how you're supposed to utilize hardware resources. You get a big heap of exposed computational primitives, and you map your design to them. Another problem as basic as data processing operations is local communication: how does an operation pass its results to the next? We multiply and then add – how does the addition get the output of multiplication? Again, the micro approach is by far the better known one. The idea is, you have registers, which are numbered somehow. We ask MUL to output to the register R5 (encoded as, say, 5). Then we ask ADD to use R5 as an input. The numbers don't necessarily refer to physical registers – they don't on machines with register renaming. More fundamentally, even when numbers do refer to physical registers, the routing is implicit. How does the output of MUL travel to R5 and then to the input port of the adder? There are wires connecting these things, and multiplexers selecting between the various options. On most machines, there are also data forwarding mechanisms sending the output of MUL directly to the adder, in parallel to writing it into R5, so that ADD doesn't have to wait until R5 is written and then read back. But even on machines with explicit forwarding (and there aren't many), software doesn't see the wires and muxes – these are opaque hardware resources. The macro approach to routing is what FPGAs do. The various computational units are connected to nearby configurable switches. By properly configuring those switches, you can send the output of one unit to another using a path going through several switches. Of course this uses up the wires connecting the switches, and longer paths result in larger latencies. So it's not easy to efficiently connect all the units that you want using the switches and the wires that you have. In FPGAs, mapping operations to computational units and connecting between them is called "placement and routing". The "place & route" tools can run for a couple of hours given a large design. This example as well as the previous illustrate micro vs macro at the extreme – a hardware resource that looks "all-important" in one architecture is invisible in another to the point where we forget it exists. The point is that they're equally important on both – the only question is who manages the resource, hardware or software. One thing DRAM controllers do is accept requests from several different processors, put them in a queue, and reorder them. Reordering helps to better utilize DRAM, which, as previously mentioned, isn't that good at random access and prefers streaming access to consequent locations. So if two processors, A and B, run in parallel, and each accesses a different region, it's frequently better to group requests together – A, A, A, A, B, B, B, B – then to process them in the order in which they arrive – say, A, B, A, A, B, A, B, B. In fact, as long as A keeps issuing requests, it's frequently better to keep processing them until they're over, and keep B waiting. Better, that is, for throughput, as well as for A's latency – but worse for B's latency. If we don't know when to stop, serving A and starving B could make the system unusable. When to stop? One macro solution is, the DRAM controller has incoming pressure signals, and both A and B can complain when starved by raising the pressure. Actually, this is "macro" only as far as the DRAM controller is concerned – it gives outside components explicit control over its behavior. The extent of software control over the generation of the pressure signal depends on the processors A and B. One micro solution is to use request aging. Older requests are automatically considered more urgent. This method is implemented in many DRAM controllers – for instance, Denali's. The macro approach is implemented in the Arteris DRAM scheduler. The micro approach is safer – the controller itself is careful to prevent starvation, whereas in the macro option, a non-cooperative processor can starve others. It also uses a simpler bus protocol, making compatibility easier for processors. However, it results in a lesser throughput – for instance, if B is a peripheral device with a large FIFO for incoming data, and can afford to wait for long periods of time until the FIFO overflows. Whatever the benefits and drawbacks – and here, we aren't going to discuss benefits and drawbacks in any depth – this last example is supposed to illustrate that macro vs micro is relevant outside of "core"/"processor" design but extends to "non-computational" hardware as well. Micro vs macro is more of a continuum than a strictly binary distinction. That is, we can't always label a hardware feature as "visible" or "invisible" to programmers – rather, we can talk about the extent of its visibility. Hardware features "quite visible" even though they don't affect program semantics. These are "technically micro" but "macro in spirit". Hardware features "quite invisible" even though they do affect program semantics. These are "technically macro" but "micro in spirit". Let's briefly look at examples of both kinds of "blurring". A good example is memory banking. The point of banking is increasing the number of addresses that can be accessed per cycle. A single 32K memory bank lets you access a single address per cycle. 2 16K banks let you access 2 address, 4 8K banks let you access 4 addresses, and so on. So basically "more is better". What limits the number of banks is the overhead you pay per bank, the overhead of logic figuring out the bank an address belongs to, and the fact that there's no point in accessing more data than you can process. Now if we look at banking as implemented in NVIDIA GPU memory, TI DSP caches and superscalar CPU caches, then at first glance, they're all "micro solutions". These machines seem to mostly differ in their mapping of address to bank – for instance, NVIDIA GPUs switch banks every 4 bytes, while TI DSPs switch banks every few kilobytes. But on all these machines, software can remain unaware of banking and run correctly. If two addresses are accessed at the same cycle that map to the same bank, then the access will take two cycles instead of one – but no fault is reported and results aren't affected. Semantically, banking is invisible. However, I'd call GPUs' and DSPs' banking "macroish", and superscalar CPUs' banking "microish". Why? GPUs and DSPs "advertise" banking, and commit to a consistent address mapping scheme and consistent performance implications across different devices. Vendors encourage you to know about banking so that you allocate data in ways minimizing contentions. CPUs don't advertise banking very much, and different CPUs running the same instruction set have different banking schemes which result in different performance. Moreover, those CPU variants differ in their ability to access multiple addresses in parallel in the first place: a low-end CPU might access at most one address but a high-end CPU might access two. GPUs and DSPs, on the other hand, have explicit multiple load-store units (a macro feature). So software knows when it attempts to accesses many addresses in parallel – one reason to "advertise" which addresses can actually be accessed in parallel. This shows why hardware features that don't affect program semantics aren't "completely invisible to programmers" – rather, there are "degrees of visibility". A feature only affecting performance is "quite visible" if vendors and users consider it an important part of the hw/sw contract. 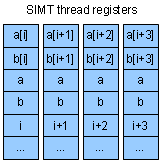 SIMD and VLIW are both visible in assembly programs/binary instruction streams. However, SIMD is "much more macro in spirit" than VLIW. That's because for many programmers, the hw/sw contract isn't the semantics of assembly, which they never touch, but the semantics of their source language. At the source code level, the effect of SIMD tends to be very visible. Automatic vectorization rarely works, so you end up using intrinsic functions and short vector data types. The effect of VLIW on source code can be close to zero. Compilers are great at automatic scheduling, and better than humans, so there's no reason to litter the code with any sort of annotations to help them. Hence, SIMD is "more macro" – more visible. Moreover, there's "macroish VLIW" and "microish VLIW" – just like there's "macroish banking" and "microish banking" – and, again, the difference isn't in the hardware feature itself, but in the way it's treated by vendors and users. An extreme example of "microish VLIW" is Transmeta – the native binary instruction encoding was VLIW, but the only software that was supposed to be aware of that were the vendor-supplied binary translators from x86 or other bytecode formats. VLIW was visible at the hardware level but still completely hidden from programmers by software tools. Why provide such a "linear assembly" language? Josh Fisher, the inventor of VLIW, didn't approve of the concept in his book "Embedded Computing: a VLIW Approach". That's because originally, one of the supposed benefits of VLIW was precisely being "micro in spirit" – the ability to hide VLIW behind an optimizing compiler meant that you could speed up existing code just by recompiling it. Not as easy as simply running old binaries on a stronger new out-of-order processor, but easy enough in many cases – and much easier to support at the hardware end. Linear assembly basically throws these benefits out the window. You spell things in terms of C6000's execution units and opcodes, so the code can't be cross-platform. Worse, TI can't decide to add or remove execution units or registers from some of the C6000 variants and let the compiler reschedule instructions to fit the new variant. Linear assembly refers to units and registers explicitly enough to not support this flexibility – for instance, there's no silent spill code generation. Remove some of the resources, and much of the code will stop compiling. Then why is linear assembly shipped by TI, and often recommended as the best source language for optimized code? The reason is that the code is more "readable" – if one of the things the reader is after is performance implications. The same silent spill code generation that makes C more portable makes it "less readable", performance-wise – you never can tell whether your data fits into registers or not, similarly it's hard to know how many operations of every execution unit are used. Personally, I believe that, contrary to original expectations, VLIW works better in "macro-centric" platforms than "micro-centric" – a viewpoint consistent with the relative success of Transmeta's chips and VLIW DSPs. Whether this view is right or wrong, the point here is that hardware features "visible" to software can be more or less visible to programmers – depending on how visible the software stack in its entirety makes them. We've seen that "macro vs micro" is a trade-off appearing in a great many contexts in hardware design, and that typically, both types of solutions can be found in practical architectures – so it's not clear which is "better". There are other common implications – for example, macro is harder to context-switch (I like this one because, while it's not very surprising once you think about it, it doesn't immediately spring to mind). I plan to discuss the implications in detail sometime soon. I intend to focus, not as much on how things could be in theory, but on how they actually tend to come out and why.